CHENNAI.OCT.23: Tamil Nadu Directorate of Indian System of Medicine and Homoeopathy has started an Integrated Pharmacy Course for two years duration this year. The course is integrated with Ayurveda, Siddha, Unani,Naturopathy and Homoeopathy. Shri S.K.Panda, Joint secretary, Department of AYUSH, Government of India distributed the admission cards to the first batch students in the brainstorming seminar organized by the Directorate last month, held at Centenary hall, University of Madras. 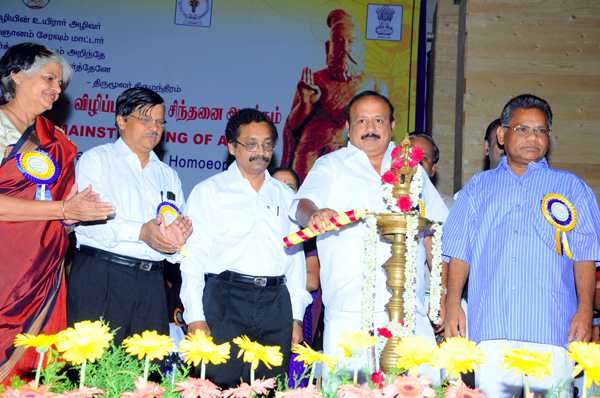 Government of Tamil Nadu conducted Diploma in pharmacy for siddha and Homoeopathy separately earlier, Now the all the systems are integrated together to fulfill the requirement in government dispensaries This two years course is being offered at Govt Siddha Medical college, Chennai and Government Siddha Medical college , Palayamkottai with the capacity of 100 students. Hon'ble M.R.K.Paneerselvam, the Minister of Health and Family welfare, Government of Tamil Nadu was the chief Guest of the occasion. Thiru V K Subburaj, Principal secretary, Department of Health and Family Welfare Thiru.G.A.Rajkumar, Principal Secretary and Director, Department of Indian Medicine and Homoeopathy, Government of Tamil Nadu, Tmt.Girija Vaidyanathan, Project Director- NRHM, also participated the function. Tmt Anita Das, Former Secretary AYUSH, Government of India distributed the appointment order to the recruited Unani doctors under NRHM scheme. Thiru G.A. Rajkumar told “ “Government of Tamil Nadu has opened 300 dispensaries under National rural Health Mission scheme. The Directorate is recruiting the Asst Medical officers for all categories and 30 Homoeopaths had been selected. 20 Homoeopathic Pharmacists post are vacant due to non availability of candidates '.